Bees are amazing creatures. The yellow-and-black-striped little things make honey and royal jelly and, given a little bit of guidance, completely stellar sculptures made out of wax. In recent years, artists have picked up on the talent. The unofficial sage of honeycomb sculptures is Tomáš Libertíny. This 34-year-old Slovakian designer has perfected a method for recruiting bees to become sculptors with little more than a rough shape to work on. Libertíny's method involves first taking a shape like a vase or a human figure and then coating it with wax. The whole structure is then covered by a transparent case and tens of thousands of bees are pumped in. Over a matter of hours or days, the bees build their famous honeycomb structures on top of the wax producing what essentially looks like a beehive turned inside out. It's a good look. The Unbearable Lightness (2010), above, shows a human figure stretched out as if being crucified and then suspended over the gallery in a glass box. Libertíny also does simpler sculptures like Vessel #2 (2011) which is currently on display at the MoMA. Recently, however, Libertíny has gotten into a bit of a row with Dewar's, whom he says ripped off his process in a new ad campaign they did for one of their whiskeys. 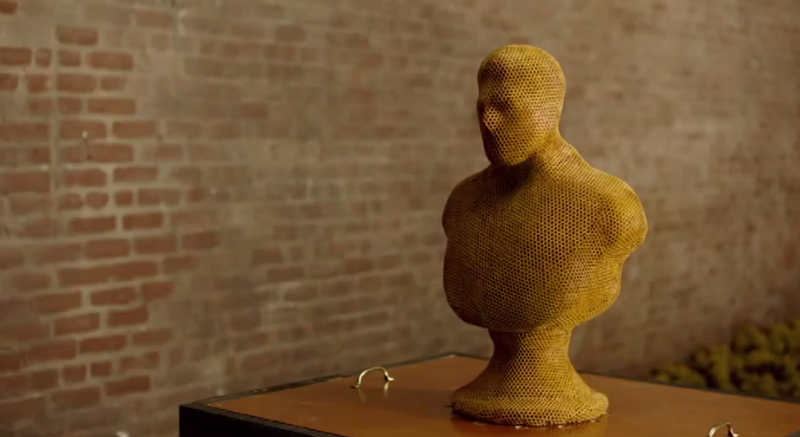 For the campaign, Dewar's contracted the help of Los Angeles sculptor James Peterson and beekeeper Robin Theron. Ripoff or not, the end result is still beautiful. And of course, Libertíny and Theron aren't the only artists to try this method out. A similar tactic was used by Garnett Puett for his late 1980s sculpture Apiscaryatid. Hilary Berseth did the same with her collection Programmed Hives.